This sticky guy is waiting for you! So, make a cool trip through the wild west. Collect all coins and stars and create the steps for him. Just try to reach the door and move to the next level. Do you think that it is so easy? Well, then just try it! Would you like to help this cute creature to move through the wild west and reach the goal? 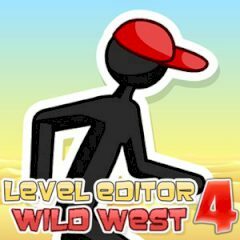 Then continue to manipulate the environment to help guide your stick figure get through each level safety and reach the exit. It is so easy! Just use your brain to solve through each level by avoid tricky traps, obstinate obstacles, and evil enemies. As you progress it gets tricker and tricker. Then race against the click and collect coins to earn extra points and more time. Are you ready for that? So, do not stop and pass all stages. Enjoy the game.